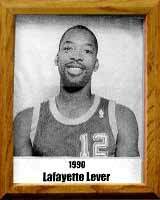 All-State at Pueblo High school and All-American at Arizona State University in basketball, Lever began his professional career first with the Portland Trailblazers and later with the Denver Nuggets. He led Pueblo to back-to-back state championships with teams called by many as possibly the best in Tucson history. Pueblo won 28 games in 1977-78 by a margin of 28.6 points per game. Lever was named to the ASU Hall of Fame and Pueblo High School named its gym in his honor in 1988. Lever was a four-year starter at ASU where he led the Sun Devils in assists and steals each season and led the team in scoring with a 16.3 average as a senior. His nickname “Fat” came from a younger brother who found the abbreviated version of Lafayette easier to say. During his time with the Denver Nuggets, he finished second on the team’s career assists and steals list as one of the premier guards in the NBA.